Nu är vi här med Caramelldansen! Now we're here with The Caramell Dance! Some time after the Speedy Techno Remake, called the "Speedycake Remix" , of "Caramelldansen" by Caramell was released, someone made a video from the Popotan H-Game opening, which was two girls bobbing up and down while flapping their hands (pictured right), and the video synced the dancing to an excerpt of the song. Now it seems the internet won't stop until at least one character from every major work is animated in that style and dancing to the song. It's almost as ubiquitous as Rule 34. 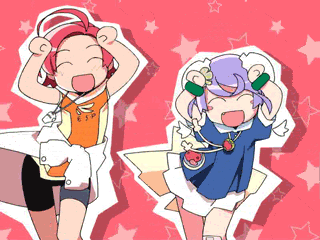 Even the official music video that was eventually made for the remix features the bob dance and animesque styling. This meme is about that effort, that now spans hundreds of different videos on YouTube and Nico Nico Douga. It doesn't help now that the band wrote an English version of the song just because of its internet popularity, including a line in the chorus saying "Look at YouTube clips do it..." They even translated the lyrics to Japanese since the sped-up Swedish singer does sound vaguely anime theme song-ish. The YouTube channel ilovecaramell even posted a German version of this song. And now, they've made a Christmas version. Again, it has to be animation like that (drawn or CGI). Simply syncing footage to the song doesn't count (it would be just an Animated Music Video). The animations might be crudely done, but the point is to actually go for that look. People at Anime Conventions have been known to spontaneously burst into this dance en masse, but those wouldn't count as this. Original version, a.k.a. "U-U-U-Aua Dance"
HD remake (English lyrics with subtitles) (alternate link ). The official Japanese music video (alternate link ). 300: King Leonidas & the Spartans. Animal Crossing: As a bonus, it's sung by K.K. Slider. Most of the cast. Surprisingly complete, considering Loads and Loads of Characters (then again, it's 10 mn long). Circles: A series of animations made by the official artist then combined independently into a Caramelldansen video with Marty, Taye, Ken, Arthur, Doug, and Paulie . Claymore: Most of the cast. Clock Tower: Most of the cast. Dance Dance Revolution: Song appears on the 2013 arcade version of DDR. Giygas deserves a special mention. Zidane, Blank, Ruby, Kuja, and Mikoto. Gears of War: Marcus Fenix, Dom Santiago, Baird, Cole, Kim, Ben Carmine, Hoffman, Anya. Adolf Hitler and Those Wacky Nazis — No, really. GPK, an Australian DarkWave singer (and he's seen it, apparently). Guitar Hero Adaptation (but playing it requires hacking a console and game). Keychain of Creation: A character actually does it in-story (last panel) ; an animated gif can be found too. ◊ No proper music video, though. Mass Effect: "Carmallreapen" by DJ Harbringer. Phineas and Ferb: "Welcome to Tokyo" from the special episode "Phineas and Ferb Summer Belongs to You!". The actual song isn't in this but the characters are doing the Caramelldansen motions. Candace: I have no idea what just happened. World of Warcraft: The female Pandaren dance emote. "Dança do Créu VS. Caramelldansen "
"Rick Astley vs. Caramell Inquisition ": Rick Astley with The Spanish Inquisition, Muppet Babies and a fair share of Moe. Chiikaboom's "SugardanSen . Features the original Popotan clip and builds an AMV around it. Live-action Caramelldansen is a common challenge request in Desert Bus for Hope. For example, Kathleen led a group in this video . The 49th game-test video from Joueur du Grenier (Takeshi's Challenge) use a Caramelldansen parody as title card, with Fred and Seb doing the dance. Various Disneyland characters attempting to do the dance. The Noob version has a small plot to it. Sparadrap starts dancing with his pets as backup dancers and invites his friends to join him. Omega Zell refuses, but Tenshirock, canonically known to have a thing for Involuntary Dance, has other ideas. In The Stinger, Gaea turns out to have filmed everything and to be planning an Instant Humiliation: Just Add YouTube!.